Mummy Hearts Money: Hey Mama Welcome To The Sixties! Oneof my Aunties celebrated her 50th birthday last night with a 60's themed costume party. From the minute I got the invitation I was consumed with the idea of channelling my inner Samantha and getting my Bewitched on. I always loved her style (except when dressed in pregnancy mumu's). 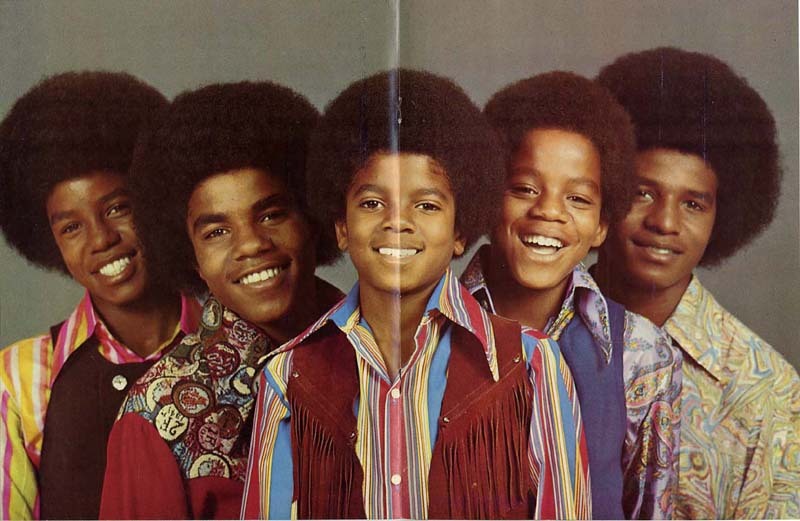 Husband on the other hand wanted more of a Jackson 5 look. I think he may have overshot Jackson 5 and ended up with Jackson Pimp, but to each his own. Not wanting to spend a fortune on an outfit that would only be worn for one night, I jumped straight on facebook to petition friends and family for any items that could be used to put towards costumes. I wasn't so lucky with clothing, but we were able to borrow jewellry that completed the outfit. Next step was to scour the op shops where I found platform shoes for me - brand new with their original shoe shop sticker - for only $6, and the most hideous shirt for Husband for $4. Darn it, if I had only shopped on blue ticket tuesday they would have been half price! Once we added my chunky, heeled Clarks schoolwork shoes to Husbands outfit he was set. And as tall as me for once with the wig and heels. Right when I was starting to despair of finding a dress for me in the op shops, Husbands sweet little grandmother offered to make me a dress. After looking briefly (once!) at a picture I showed her, she proceeded to run up a little item using fabric from her stash, that she jokingly tells me is probably from the sixties anyway. At least I think she was joking. 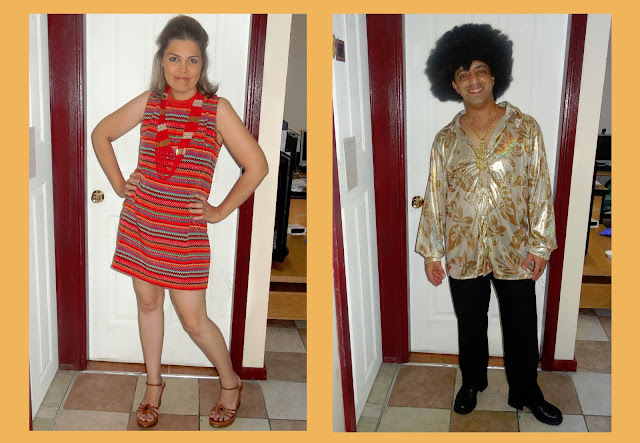 Adding a little costume shop bling and a wig for Husband and the total cost of our outfits for the night was $26. Not bad considering the costume shops wanted $60 EACH for hire. Going all out for a costume party doesn't HAVE to be expensive if you use your connections and what you already have before spending any money. However in my enthusiasm, I overshot the mark and we ended up being the most overdressed at the backyard BBQ style party. Not the first time that has happened. I really really love me a costume party. Know someone in Townsville or QLD who would LOVE to go to the V8's? Send them here for their chance to win passes. Pimp or Jackson 5? What do you think? Do you have any tips for pulling together a costume on a budget? Yeah, I kind of thought we shot way past Jacksons and ended up pimp but it was still fun! Oh gosh I love a good costume party. You look awesome! I always tend to overdress at costume parties too, mainly because people don't seem to put in the effort I think so when you do put in a bit of effort, you really stand out haha. But I love that there are people like you who love it just as much!